Mrs May should consider dropping her red lines “in the national interest” and become a facilitator to find out what Parliament wants, he said. Tory Brexit supporter Suella Braverman dismissed his “Remainer elite” views. Meanwhile, shadow Brexit secretary Sir Keir Starmer has said there are “in reality, just two remaining options” for Brexit – to instruct the government to negotiate a close relationship with the EU, including a customs union, or for there to be a public vote. He told the Fabian Society conference in London that it “seems inevitable” the government will have to apply for an extension to Article 50. Labour has responsibility “in this moment of national crisis” to “offer a constructive path forward”, said Sir Keir, adding that there are “no easy routes out of this mess”. “It’s now time for an open and frank debate about how we break the deadlock,” he said. It comes after Labour leader Jeremy Corbyn refused to meet Mrs May for talks to discuss a way forward, unless she takes the possibility of a no-Brexit deal off the table. Sir Keir also said what Mrs May is doing is “not resilient, but reckless”, and that she was “ploughing on without a plan” and “reducing the time for a credible alternative to emerge”. Speaking on BBC Radio 4’s Today programme earlier, Sir John warned that no deal would be the “worst of all outcomes”. He said that “millions of people” – both individuals and businesses – would be hurt in such a scenario. “Tinkering” with her deal will not make a difference to the current situation, he added. Westminster is currently stuck on what happens next with Brexit. There are a range of different views in Parliament, but no certainty that any of them would command majority support. Indicative votes are a proposed solution. MPs would be given a free vote on various proposals, from a second referendum to a customs union to a free trade agreement. The idea goes that this would allow MPs to express what they really think, free from party commitments. It could, proponents believe, end the log-jam. But as we’ve documented at length in recent weeks, there is no guarantee it would. One thing is certain just now; a lot of work still needs to be done if a consensus is to be found. 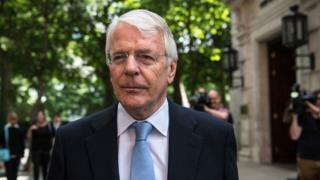 Sir John said the prime minister had been “handed a poisoned chalice” and that things had been “extremely difficult” for her. “Her position has been all but impossible,” he said, adding that Parliament was “running out of time”. If Mrs May does not drop her red lines “in the national interest”, then her options are either for the Cabinet or Parliament to decide or for there to be another referendum “now more facts are known than were known in 2016”, Sir John argued. He told the programme: “The prime minister argued valiantly for her deal. She fought for it but the House of Commons killed it and killed it comprehensively. Ideally, all party leaders would give their MPs a free vote to allow an “honest representation” of opinion. He called for compromise to prevent any further splits, as “no one is going to get their way”. It is now very unlikely we will leave the EU on 29 March “bar a miracle”, he added, arguing that a delay would be “wise”. She has also called for the Irish border backstop – the position of last resort, to maintain an open border on the island of Ireland – to be scrapped.